Jason Gillespie was the man in form as West Indies lost three wickets in their second innings chasing a massive total of 407 runs to win the second Test. 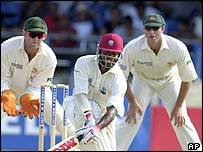 Captain Brian Lara is the main hope, unbeaten on 52, with Ramnaresh Sarwan yet to score after Gillespie had reduced the hosts to 12-2. Australian captain Steve Waugh declared shortly before tea upon the dismissal of Darren Lehmann for 66. At the time, Matthew Hayden, making a welcome return to form, was unbeaten on 100. India once scored 406-4 to beat the West Indies at this ground in 1976, but Australia will be strong favourites to win on Wednesday. West Indies have never scoredmore than 348 to win a match. Gillespie took the wickets of Devon Smith and Daren Ganga early in the run chase. Smith was trapped on the crease, falling lbw for his second duck of the match. Ganga ended a run of consecutive centuries when he was well caught low down at first slip. But Lara and opener Wavell Hinds staged a recovery, with Hinds reaching 35 alongside his skipper before falling to spinner Stuart MacGill. The Aussies, 199 runs ahead of their hosts after day three, added 99 runs in the morning before cutting loose after lunch. Hayden's ton came off 180 balls with 10 boundaries after three low scores in the series. Lehmann provided the fireworks in his knock of eight fours and two sixes off 96 balls. He was finally yorked by Merv Dillon. After a shaky start Hayden grew in confidence but Lehmann, a first-innings centurion, was given two lives as he again got among the runs. After surviving a possible run out, he was then dropped by Wavell Hinds at point off Vasbert Drakes. Vice-captain Ricky Ponting was the only Australian casualty in the morning session. Ponting's dismissal, caught behind off Dillon for 45, followed a number of heated exchanges between the two players. There was a sour postscript, too, when Ponting was incensed to be struck on the head by the fast bowler's torso as Dillon ran past the batsman to celebrate. A win for the visitors will see them retain the Frank Worrell Trophy. West Indies: Brian Lara (captain), Ramnaresh Sarwan (vice-captain), Wavell Hinds, Devon Smith, Daren Ganga, Marlon Samuels, Carlton Baugh, Dave Bernard, Vasbert Drakes, Mervyn Dillon, Pedro Collins. Australia: Matthew Hayden, Justin Langer, Ricky Ponting (vice-captain), Darren Lehmann, Steve Waugh (captain), Adam Gilchrist (wicket-keeper), Brad Hogg, Andy Bichel, Brett Lee, Jason Gillespie, Stuart MacGill.